I keep my garlic on my kitchen shelf by the window. 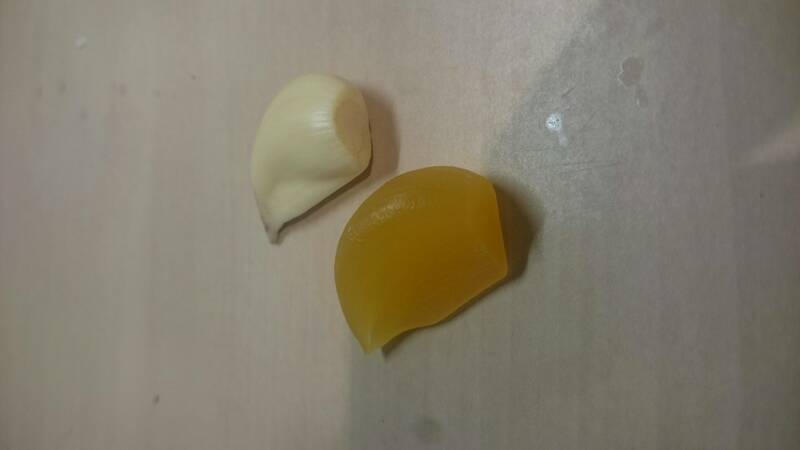 Out of the whole garlic bulb one the cloves has changed to a yellow/orange colour and its texture is like hard jelly. Its slightly squidgy but firm. How has this happened? Is it edible? This is called waxy breakdown. It's a defect rather than a disease, so you don't have to worry about a microbe or parasite. My neighbors have used affected cloves and they're still alive, though I've never been able to make myself use them because of the texture. Why is my garlic brown and slightly translucent?